The ECI has been built and rebuilt several times (see Timeline). There have also been times when there has been no movement at all. Now the railroad has begun to move back in time to be able to run NYC, PRR and PC locomotives and cars. 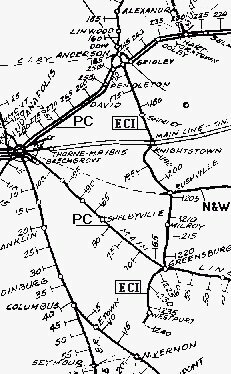 The ECI is a 1970s short line operating out of Anderson in North Central Indiana southward over the ex-New York Central (CCC&StL) Michigan Division /PC North Vernon Secondary purchased from Penn Central. The ECI runs through Emporia, Rushville, Greensburg and terminates in the Southern Indiana town of Westport. 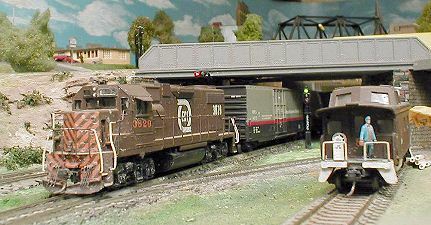 Connections are made with the CIW (Central Indiana & Western) at Anderson, and the N&W at Rushville, with a secondary connection with PC Greensburg. The ECI has rights between Anderson and Westport under control of the ECI Dispatcher working out of the South Anderson Yards. The majority of customers are small industrial companies (pipes, plastics, autoparts, etc.) as well as several heavy grain operations and one small stone quarry sending occasional shipments off line to dealers nationwide from their quarry near Westport. Although the line is not truly prosperous, it does make money and has an outstanding Service Facilities with a maintenance crew devoted to rebuild and maintenance with tender loving care. This is attested to by the Ex-NYC E7 that has been placed into service pulling an Excursion Train consisting of four refurbished passenger cars from Anderson to Westport monthly during summer months and the NYC GP7, and RS3 that have been put into service on the railroad. Also, thee is the 0-8-0 that does some freight work on the ECI. The ECI GP 38-2 is now handling the grain operation at Westport. and the railroad itself has changed since then. Notice: I have an Electronic Rail Pass available to exchange with you or to send you upon request. The actual Rail Pass is 550x350 and is available in either a GIF or JPG format, whichever you prefer. E-mail your request to Roger Hensley rhensley6@gmail.com and I will E-mail your pass to you. 1980 - original 4x7 layout. Town of Westport. 1983 - 4x4 yard section added. Now L shaped. 1986 - removed yard section and built across back wall with new yard with return loop. To be connected to a new city section. 1987 - raised layout 6 inches. 1988 - city area in place with track through it and reversing loop under. 1991 - East Yard added to extend track through and beyond city. 1995 - major operational problems with original track moving with seasons. Ripped out original table structure, saved farm area and all buildings. Reversed layout of town of Westport placing farm at other end of section. 1997 - added a leg to Westport for Grain Operation. 1999 - Began changing to under table slo-motion switch machines and LED control panel operations. Began rebuilding of grain elevator area. 2004 - replaced an industry in East Yard with a new plastics plant. 2005 - Installed new backdrop behind grain elevator area. 2006 - Completed the grain elevator scene with buildings, storage bins and actual elevators. 2006 - Completed Westport with cars, figures, trees and buildings. 2008 - Ripped off half of city to correct the underlying track. 2009 - Added a drop down section to the Grain elevator at Westport. 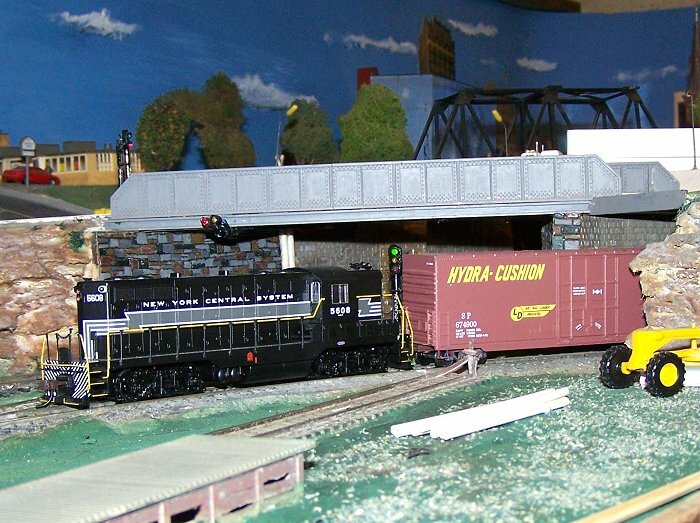 2010 - Wired Westport Elevator to more easily use DCC with it. 2012 - Added another rail line under the hills with two switched and a shut off section. 2012 - Added two Reverse Loop automatic control units to make reversing automatic. 2013 - Reversing Units failed. Took out automatic units to make reversing by DPDT switch. I say that it is the same layout, but the only original piece is the farm scene. Copyright 1995-2018 by Roger P. Hensley. All Rights Reserved.